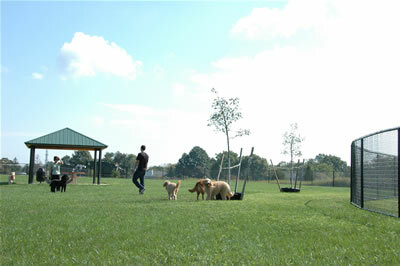 The 1.5 acre off-leash area at Thompson Park, Lincroft consists of a 1¼-acre area for dogs over 35 lbs and a ¼-acre “small dog area” for dogs that weigh 35 lbs or less. 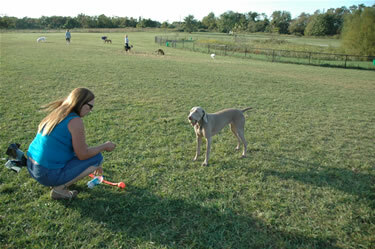 Visitors are to park in the Three Barns parking lot located adjacent to the off-leash area. Water is available at this site and toilets are located in the nearby Creative Arts Center. The Wolf Hill Recreation Area off-leash dog area combines an area for dogs of all sizes as well as a smaller area for dogs 35 lbs. or less. The area features two concrete patios with sheltered picnic tables while the small dog area includes one concrete patio with sheltered picnic area. Dog waste bags and garbage cans can be found in both areas. This site features portable toilets near the parking lot and, at present, there is no water source for pets or owners. There is ample parking located next to the area off of Crescent Place. 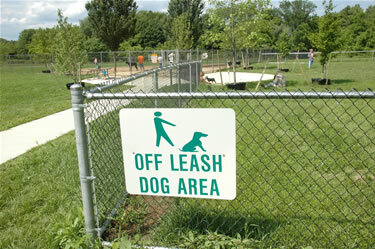 Both off-leash dog areas are open 7 days a week from 8 a.m. to dusk. Please note that the Wolf Hill Recreation Area Off-Leash Dog Area will open at 9 a.m. on Wednesdays mid-April through mid-September. The delayed opening is due to facility maintenance. In order to use the facility, puppies must be at least 4 months old, and dogs 6 months or older must be spayed or neutered. All dogs must be up to date with vaccinations and wear a collar with license. Each owner may bring up to 2 dogs, must remain with the dog(s), and should carry a leash for each animal. Children under the age of 8 are not permitted in the off-leash areas, and all youngsters should be closely supervised by an adult. 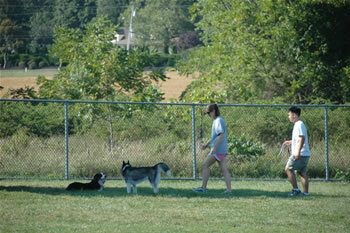 There is a limit of 20 dogs and 25 owners inside each fenced area at any one time at the Thompson Park facility. Guidelines for Thompson Park are available here. There is a limit of 25 dogs and 35 owners inside each fenced area at any one time at the Wolf Hill Recreation Area facility. Guidelines for Wolf Hill are available here. While Park Rangers are responsible for cutting grass and for general maintenance, owners are responsible for cleaning up after their pets. A complete list of regulations is posted at each facility. For more information about the off-leash areas, call the Park System’s public information office (732-842-4000, ext. 4256) weekdays during regular business hours.